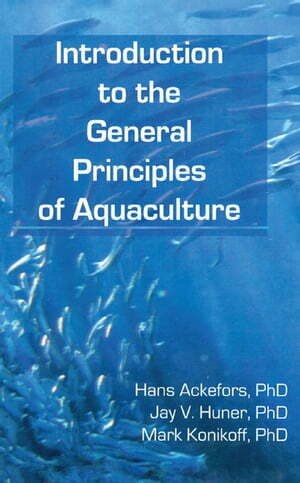 Collins Booksellers - Introduction to the General Principles of Aquaculture by Mark Konikoff, 9781351436489. Buy this book online. Introduction to the General Principles of Aquaculture provides novice aquaculturists with an overview of the aquaculture industry so you may proceed successfully in academic studies or commercial ventures. The authors furnish you with insight into the history and development of aquaculture and cover the subjects of natural production versus aquaculture, the aquatic environment, energy requirements of and relationships in aquaculture systems, important components of aquaculture systems, selection of aquaculture species, major cultured species and their distribution, global aquaculture production, a comparison of agriculture and aquaculture, and those factors promoting and constraining aquaculture. The book is liberally illustrated so that students and laymen are able to visualize systems and species. Furthermore, tables and figures are used throughout to emphasize important points, facts, and methods. As an introductory text, it emphasizes several aspects of aquaculture that must be understood by those new to the industry. These aspects include water quality, species of importance around the world, and current and projected aquaculture production on a global basis. The important components of any aquaculture system are also covered in some detail--biological factors, technical-biological factors, technical-economic factors, production cost factors, socioeconomic factors, and species selection factors.